The violin is the smallest member of the string family. Sound is produced by drawing the bow across one of the four strings or by plucking the string with a finger. All string instruments produce sound in the same manner. The main differences are the sizes of the instruments and how high or low each instrument can sound. A small amount of maintenance and cleaning of the violin is needed. It is important to clean the instrument with a soft rag and occasionally change the strings. The most time consuming activity other than playing the instrument is tuning. The violin should be tuned every day or every time it is taken out of the case. In the beginning, teachers tune the string instruments for each student. Eventually, students will learn to tune their own instrument. The violin comes in just two pieces, the instrument and the bow. The bow uses horsehair or a synthetic material to vibrate the strings as it is drawn over the instrument. The bow should be tightened to just the right tension before it is used and loosened before it is put away. The violin is played with the instrument under the chin on the left side. A shoulder pad is used under the violin and on top of the left shoulder. Teachers may encourage the use of a simple foam pad or a pad that attaches to the bottom of the violin. The right hand holds the bow at the bottom (the bottom of the bow is called the Frog) and draws the bow over the strings. The correct hand position for both hands as well as posture and arm positions are critical at the beginning stages. Beginners should not practice extensively without guidance from a teacher. Developing bad habits at the beginning stages may be very difficult to break. The violin is a very old instrument. It has been basically unchanged for hundreds of years. 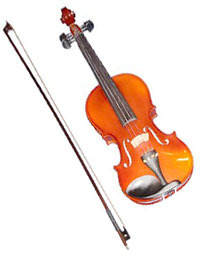 It may sometimes be called a fiddle for country music or a violin for dozens of other types of music but the instrument is the same regardless of where it is played. Some variations on the violin include modern electric instruments which are very similar in the way they are played. They are just missing the body and shape of a violin. The sound is amplified electronically rather than from the body of the instrument. Electric violins are not for beginners but they are a fun addition for an accomplished violinist. A unique feature of student violins is the huge variation in sizes. Buyers have the option of a full size, 3/4 size, 1/2 size all the way down to a 1/16 size violin. The correct size for each student depends on the arm length and overall size of the student. Generally speaking, by the time students reach 6th or 7th grade, most will require a full size instrument. Before that age, students should really be measured by a music teacher to determine the correct instrument. Its also important to know that the sizes of 1/2 or 3/4 are not meant to be literal measurements. A 1/2 size violin isnt half the length of a full size instrument. These fractions are used as arbitrary labels for smaller instruments. The violin is a very popular instrument for beginners. Since lots of other students will choose the violin, there will be more competition with other players. However, the violin is one of the most widely used instruments in the world. It is well known for its use in symphony orchestras as well as country and bluegrass bands and other popular groups. The violin is also extremely popular as a solo instrument. There are lots of choices for purchasing a violin. They are relatively easy to find as a new or used instrument. Giardinelli sells some good beginning models. If a full size violin is needed the Silver Creek model 2 violin 4/4 is an option. The next step up in full size violins would be the Silver Creek model 4 violin. Purchasing a used violin can be a good option if it is purchased with caution. Older violins or violins that have not been well maintained can easily be in need of repair. A lack of humidity, temperature changes or just time can cause damage to the instrument. Small cracks in the wood develop which can be very costly to repair. Buying a used instrument is only recommended if you know an advanced violinist or orchestra teacher who can test a used instrument before you buy.